Well I suppose that makes me feel “better”, knowing that apparently it’s not a battlegroup problem so much as it may be a map design problem. LOL @ cannons in LM. And so, so true. When you said aerial combat, at first my mind went to the gunship. On a reread I realised you were also classifying siege vehicles in there, because of LOS issues, and that’s absolutely true…anything with projectile motion makes small issues of terrain design markedly more important than places where combat takes place within 30(36) yards with people shooting at each other. Do you know if you get a range bonus if your siege vehicle is on higher ground than the target? Be interesting to find out, because that could have radical implications for the very-hilly terrain in IoC. I don’t exactly know what to do once/if we win and hold the Docks – it doesn’t seem to bring down their walls especially fast – but losing the Docks does often mean an automatic loss for Alliance. Which doesn’t make sense to me either. Docks has a distinct advantage for both sides. The glaives, if defended, bring walls down fast. Even without quarry or oil refinery under control, each shot hits the wall for ~5k damage. Keep the glaies protected, and they put a hurt on the walls. Add in the catapults and any jumpers you might have from the hangar doing an ant-run with the Huge Saronite bombs that hit for ~9-10k apiece, and they bring the walls down in no time flat. The problem on both ends, however, is nobody likes playing defence. If your side takes the workshop and nobody bothers to come and attack it, your HK count (and thus, your overall honor) is significantly less than playing paratrooper from a gunship and swooping down into the other side’s keep. But let’s face it: Defence wins games. The workshop seems to work equally as well as docks in my experience if people are actually carrying bombs. 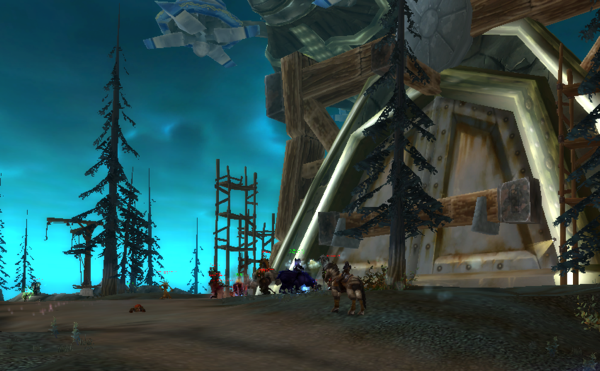 If everyone on offense attacking the alliance fort, use bombs or demolishers, it goes down just as fast as using glaives. The way, someone got people to use bombs is by telling them about the achievement they get for using 5 bombs in 1 game.